Twenty two different knapweed species (Centaurea sp) are well established in North America. Most are introduced opportunists that have aggressively invaded natural areas, pastures, open woodlands, rights-of-way, and disturbed areas. Brown (C. jacea), black (C. nigra) and meadow knapweed (C. ×moncktonii) are long-lived perennial plants that are problematic in the United States and southern Canada. The three knapweeds are similar in appearance (Figure 1) and reproduce primarily by seed; however, root crowns can regrow when fragmented by cultivation or other disturbance. Meadow knapweed is a fertile cross between brown and black knapweed. Figure 1: Distribution and identification characteristics of brown, black, and meadow knapweed. The key to separating these species are the involucre bracts.1 States shaded green in distribution maps indicate presence of knapweed. (Bract images from Pacific Northwest Extension Publication PNW432). Click here to compare spotted knapweed with brown, black, and meadow knapweed. 1. Involucre bracts are small leaf- or scale-like structures surrounding an inflorescence, located just below flower petals. 2. "Entire leaf margins" refers to leaves that are neither toothed, lobed, nor compound, i.e. simple with smooth margins. These three knapweeds were introduced to North America as contaminants of crop seed, in soil carried as ballast on ships, or as ornamentals. Once established, knapweed can form dense monocultures, out-competing other more desirable plants. This can result in increased soil erosion and reduced forage, wildlife habitat, and species diversity. Figure 2: Percent control of brown knapweed 35 and 71 days after herbicide application (DAA); from field studies conducted in New York state. Limited information is available for controlling black knapweed; however, black, brown and meadow knapweed share similar morphological characteristics, and management should be similar between the three species. Early detection and control is the key to managing knapweeds. Figure 3: Percent control of meadow knapweed 78 and 379 days after application (DAA); from field studies conducted in Oregon. Field studies were conducted to determine the effectiveness of selective herbicides on controlling brown and meadow knapweed. Herbicide treatments were applied in late spring when knapweed plants were actively growing and less than 12 inches tall. Spray volume was 20 to 30 gallons of total spray solution per acre. 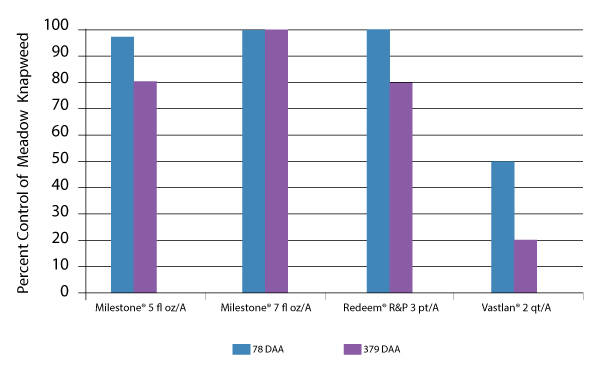 Results from the studies show that Milestone® specialty herbicide at 5 to 7 fluid ounces per acre (fl oz/A) provided better control than other broadleaf herbicides (Figures 2 and 3). Milestone at 7 fl oz/A provided more consistent, long-term (>1 year) control of meadow knapweed, compared to the 5 fl oz/A rate. The recommended application timing for Milestone on brown, black, or meadow knapweed is from rosette to early flower, or in fall. Small infestations of brown, black, or meadow knapweed can be controlled by hand pulling or digging individual plants. Older, established plants have a large root that is difficult to remove. Digging the entire root, or severing roots 2 to 3 inches below the crown with a shovel, will provide good control. Mowing at late bud to early bloom stage may reduce seed production; however, plants are not effectively controlled since knapweed can flower and produce seed below the mowing height. Cultivating with a disk will control young plants and seedlings, but older plants can survive and regrow if fragments of the root crown remain. Livestock utilize knapweed as forage to some degree. Proper stocking rates and management practices that promote a healthy desirable plant community will reduce knapweed competitive ability. Several biological control agents released for control of spotted (C. stoebe) and diffuse (C. diffusa) knapweed have been reported on meadow and brown knapweed, but have minimal effect. The seed head weevil (Larinus minutus) may reduce meadow knapweed seedling density. Preventing the introduction and establishment of knapweeds is the best course of action; however, it is difficult to stop weed invasion. Early detection and treatment, before plants are well established and develop a seedbank, increases control success. Identifying knapweed plants when they first establish on the landscape allows managers to use a variety of control methods, including hand removal and spot-spraying with herbicides. Burch, Pat. Field Scientist. Corteva Agriscience. DiTomaso, JM, GB Kyser et al. 2013. Weed Control in Natural Areas in the Western United States. Weed Res. and Info. Center, Univ. of CA. 544 pp. Dow AgroSciences. Internal field data on brown and meadow knapweed. EDDMapS. 2018. Early Detection & Distribution Mapping System. The University of Georgia - Center for Invasive Species and Ecosystem Health. Online: eddmaps.org; last accessed September 27, 2018. Roché, C.T. and Roché, Jr., B.F. 2000. Identification of knapweeds and starthistles in the Pacific Northwest. Pacific Northwest Extension Publication PNW432. Milestone® specialty herbicide is not registered for sale or use in all states. Contact your state pesticide regulatory agency to determine if a product is registered for sale or use in your state. When treating areas in and around roadside or utility rights-of-way that are or will be grazed, hayed, or planted to forage, important label precautions apply regarding harvesting hay from treated sites, using manure from animals grazing on treated areas, or rotating the treated area to sensitive crops. Consult the label before purchase or use for full details.